The rose is symbol of hope, promise, new beginnings, friendship, and love. The color of the rose offers different interpretations of its meaning. A yellow rose, for example, is associated with friendship. A red rose, on the other hand, is associated with passion and love. A woman who feels passionate about something in her life, may wish to express this feeling through art. The nails can provide a perfect canvas for your passion! 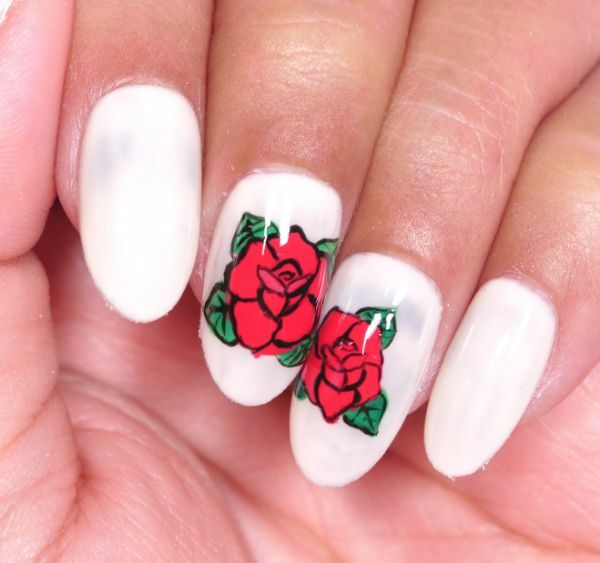 Choose a finger on each hand to feature a rose tattoo nail. Prepare your fingers for nail art. This involves trimming your cuticles, buffing and your nails. Next, apply isopropyl alcohol-based cleanser to remove any oils and to optimize the adherence of gel nail paint. Finally, allow your nails to dry before applying paint. 1. Paint nails white with Mission Control Fizz. Allow nails to dry. 2. Dip a dotting tool in Mission Control Power. 3. 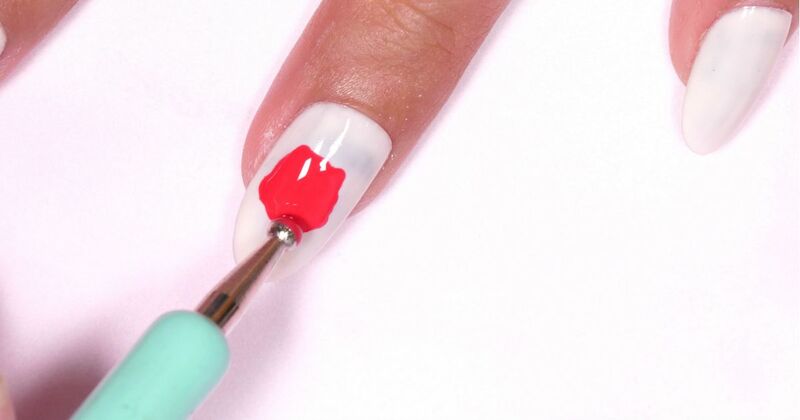 Apply the red gel paint to the center of the nail. Swirl the paint around in a circular motion, making a few points at the edges of the circle. The goal is to create the shape of a rose. Allow the paint to dry. 5. Draw four green leaves around the red rose. Allow the paint to dry. 6. Dip a fine detail brush in Mission Control Over Drive. 7. Draw five small interlocking petals in the center of the red rose. Allow the black paint to dry. 6. Extend the small petals drawn in previous step by surrounding them with four larger petals. Draw the outline of the larger petals, dragging the fine detail brush to the edges of the red rose. 7. Outline the red rose with black paint, using the same fine detail brush. 8. Dip another fine detail brush in Mission Control Giant. Add a few strokes of green paint to the darker green leaves to add highlight. Allow the paint to dry. 9. Outline the green leaves with Mission Control Over Drive. Gently trace the leaves with the black paint. 10. Use the same fine detail brush to draw a central vein in the center of each leaf. Add three diagonal lines on each side of the central vein, for a total of six diagonal lines on each leaf. 11. Allow the paint to dry, then add Clear UV Top Coat Gel to promote longevity of the design. 12. Repeat Steps 1 to 11 to create a rose tattoo on the other hand.